Could Party Poker Return To The US Market? 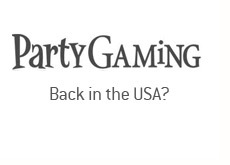 Martin Weigold, the finance director at PartyGaming, recently had some interesting comments regarding the company's possible return to the United States. Weigold stated that the company is "hopeful" about being allowed back into the US market in the "not too distant" future. These comments have attracted a great deal of attention, as Party Poker was the most popular online poker site before pulling out of the United States. There are many American players who would love to return to Party Poker. The company cited Barney Frank's push to overturn the UIGEA as the reason for their optimism. According to well-placed sources, Congressman Frank will be introducing his bill to repeal the UIGEA regulations sometime in March of this year. Many people feel as though this is the perfect climate to repeal the UIGEA regulations. Banks are dealing with a myriad of their own problems right now, and don't need to be burdened with trying to enforce UIGEA regulations. The government is in desperate needs for new revenue sources, and may be salivating at the tax revenues that could be generated by licensing and regulating online gambling in the United States. Also, pushing through this anti-UIGEA legislation through Congress will be much easier after the recent elections in November. Barney Frank will have much less trouble pushing through this legislation through the House and Senate. Some people point out that Party Poker "isn't the same as it used to be", and that the site isn't nearly as "fishy". These people are completely missing the point. Competition is a good thing, and having an influx of big online poker rooms into the US market only benefits the average poker player. Bigger and more aggressive bonuses. More tournaments. More big Sunday tournaments. More WSOP packages to be won. The list goes on and on. Plus, the repealing of UIGEA regulations would make it much easier to deposit and withdraw from sites. I guarantee you that if the UIGEA regulations are repealed, then Neteller will immediately return to the US market. How good would that be? Also, some people are of the opinion that online poker is "illegal" in the United States right now, so they stay far away. Many if UIGEA is repealed, then these people (who are presumably soft players overall) will return to the online poker sites. Let's keep our fingers crossed and hope Congressman Frank can push this bill through this year.